Were you one of those women deeply affected by the book Women Who Run with the Wolves? So many were! Now, Clarissa Pinkola Estes, PhD, is coming out with her long awaited new book and speaking about it in Sedona October 9. Find out more! June 02nd 2011 - It’s been almost 20 years since Dr. Clarissa Pinkola-Estés, an internationally recognized author and Jungian psychoanalyst, changed women’s lives by sharing stories of women’s wild, adventurous, side in her bestselling book Women Who Run With the Wolves. This October, in Sedona, Arizona, Dr Estes, unveils her long-awaited new book at the inaugural Woman Arising event Sunday October 9 and Monday October 10 at the Enchantment Resort in the glorious red rocks of Sedona Arizona. There, Dr Estes will be joined by inspiring, legendary women and educators such as actress, author and advocate of human potential Lindsay Wagner (of Bionic Woman fame), Hay House author and respected intuitive counselor Colette Baron-Reid, founder and president of Namaste Publishing Constance Kellough, transformational leader and associate minister of Denver’s Mile-Hi Church Cynthia James, and acclaimed recording artist Kathy Zavada. 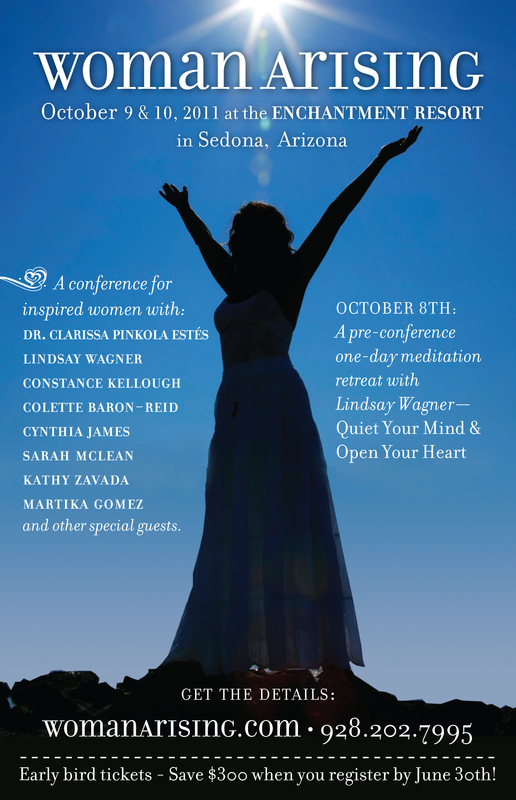 “We created this weekend for women so they can take a personal journey to Sedona – one of the most glorious spots in the world – where they can delve deeper into the meaning of their lives, honor their own stories, and follow their own spiritual path. They’ll be inspired by personal stories from many dynamic speakers and they’ll also discover practical tools for transformation. On Saturday, October 8, Lindsay Wagner offers a pre-conference day-long meditation retreat – Quiet the Mind & Open the Heart, open to both men and women. “Women want to be inspired by other women, I know I do! I want to hear from women whom I can connect with, identify with, and relate to. I want to hear how these women transformed their lives.” says Sarah McLean, of the Sedona Meditation Training Company and founder of the Woman Arising weekend. McLean will be sharing her own journey of self-discovery and how she found her authentic voice. Constance Kellough, president and founder of Namaste Publishing, a Canadian publishing house with a focus on mind/body spirit books, opens the dialogues on Sunday morning. She shares her story and how she has been able to live passionately. She inspires participants with her keys to discovery which have grown out of her direct experiences – keys that can assist anyone to live a more joyful, grace-filled life. Lindsay Wagner will then share her personal and professional journey as a woman on the path of integrating body, mind and spirit and awakening to Oneness. Wagner says, “Every one of us is so much more amazing than we even know. Our experience in life comes from our perspective. I say, shift the perspective and experience the difference.” Wagner now leads Quiet the Mind & Open the Heart workshops and retreats internationally. Participants will be served a signature chef-inspired luncheon, and encouraged to will address questions such as: What is the nature of feminine power? What gets in the way of speaking my truth? How can I best serve my family or my community? during their lunch breaks. Clarissa Pinkola Estés PhD, will then deliver the afternoon keynote. She’ll also sign her new book, Untie the Strong Woman. Monday morning after a sunrise meditation led by Sarah McLean, gentle Anusara-inspired yoga with Alisa Gray, or a hike in the paths through the red rocks, women will be inspired by noted intuitive counselor Colette Baron-Reid. After lunch, transformational speaker and author Cynthia James presents a talk on Sacred Woman/Holy Life. She’ll guide women with wisdom from feminine archetypes and help them to embrace the strength and power of what it means to be the Divine Feminine. Amanda Christmann Larson, will emcee the event. "I hope that others learn from me that you don't have to be anyone special or wait until you're in just the perfect place in life to follow your dreams,” shares Larson. After leaving a career in publishing in search for more meaning in her life, Larson founded the non-profit organization, Compassionate Journeys, designed to transform lives through guided service trips to Africa. The weekend will close with a ceremony with Andean medicine woman and sacred sound healer, Martika. Though the event is only open to women, men will have the opportunity to join in on a pre-conference day-long meditation retreat led by Lindsay Wagner, Quiet the Mind & Open the Heart. Participants will enjoy one of the country’s most inviting destinations while being engaged, entertained and inspired, the Enchantment Resort. Nestled on 70 acres amidst national forest land and the fabled Red Rock Secret Mountain Wilderness, Enchantment has been ranked by Travel and Leisure Magazine as one of the three best resorts in the U.S. It offers luxurious accommodations and architecture that harmonizes with the timeless beauty of the land. With is easy access to hiking and mountain biking trails, award-winning restaurants, and the Mii amo Spa offering ayurvedic and Native American healing massage treatments, it’s the perfect retreat location for anyone. Woman Arising! is sponsored by Sedona writer/artist Victoria Nelson, The Sanctuary at Sedona, Stone Nation Rising, Namaste Publishing, Heart Wisdom Journeys, and Sedona Meditation Training Company. Tickets for Woman Arising are available through www.womanarising.com or by calling 928-202-7995. One can attend the meditation retreat, or the dialogues on Sunday and Monday or the entire event. When you register by June 30, you’ll save$300! Almost 50%. Sarah McLean is an explorer of the inner and outer worlds and has been meditating since 1989. She worked with Deepak Chopra, Debbie Ford, Gary Zukav, and Byron Katie among others. Each hired her to help them share their knowledge and talents with the world. As she developed mind/body health centers, self-discovery programs, curriculum, and events for them worldwide, she was fortunate enough to become immersed in their wisdom and knowledge. This has been an important part of her path to self discovery. McLean has journeyed thousands of miles through Europe, the Middle East, and Asia by bicycle in search of the secrets of this world and this life. After eight years working at Deepak Chopra's center as the Education Director, she traveled to India to meditate for six months, and then resided in a Zen Buddhist training center for two years before moving to Sedona, Arizona. McLean, as the director of the Sedona Meditation Training Company, has created programs to help demystify meditation, and provides retreat environments for each participant to experience deep silence and self-awareness. She says her mission is to share her discoveries of expanded states of awareness and the mysteries of life, and to teach as many people as possible the practices of meditation in a nourishing and engaging learning environment. She likes to inspire each participant to still their mind, experience present moment awareness, come to know their true essence, and live a fulfilling life. Karen Koebnick has more than 25 years of experience in the meeting, incentive and travel industry. She has escorted groups from Belize to Israel, from the Mayan Riviera to the Emerald isle, always with emphasis on spiritual renewal, inspiration, creativity and personal growth. Karen’s most recent success is the celebrated Gift in Shift conference which she created and held for five years in Sedona, Arizona. This conference sold out from its inception and brought together the most cutting-edge authors, speakers and film-makers in science and spirituality today. It helped transform the lives of hundreds of attendees from around the world. After producing popular events in Sedona for many years, Koebnick’s latest venture is expanding into Heart Wisdom Journeys – a business that takes people on pilgrimages to sacred sites to deepen their awareness of who they truly are, and bring them into their life’s true purpose. Karen’s attention to detail and wide-sweeping knowledge of travel and tourism means that each participant on the journeys can relax and enjoy the beauty and grandeur of ancient places knowing that every component of their stay has been attended to. Sandy Trudel serves as Director of Development for the New Way Academy, a K-12 school for children with learning difference such as dyslexia and ADHD. She also heads up the bookstore for New Vision Center for Spiritual Living in Scottsdale and is a certified Life Coach. A lifelong learner and teacher, Trudel has produced multiple events in the Phoenix area and brings her passions to Woman Arising.